Polygonatum hookeri is an unusual dwarf species. 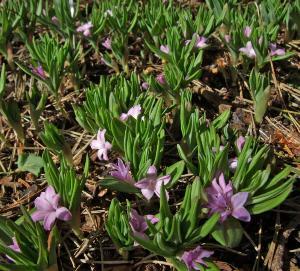 The flowers emerge before the foliage. Flowers are deep pink, up to 1 cm wide and cup shaped. The foliage when it appears, is pale green in whorls and has one or two whorls per stem. Easy to grow. Prefers moist soil in a shadier area. Height 2.5cms.